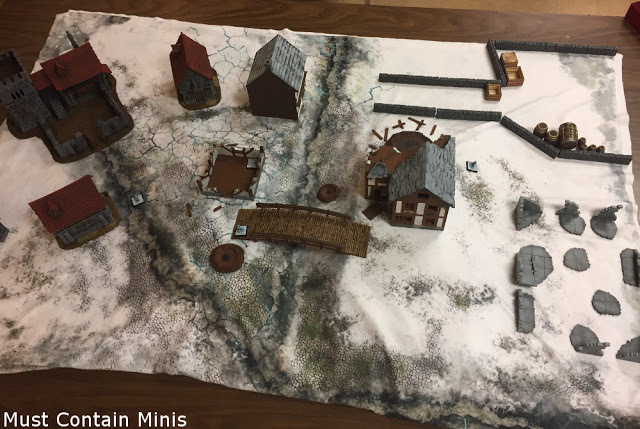 At Broadsword Three, I hosted yet another game of Frostgrave to a new group of players. 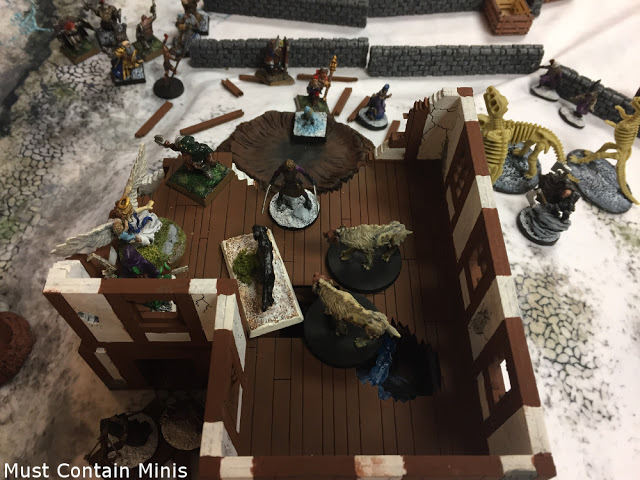 For those that read my report about Frostgrave at Hotlead, I ran the exact same scenario there but this time, things went differently. This time, the Major Demon Tiszirain was actually summoned! After killing the evil wizard, a sinister player actually summoned Tiszirain himself! 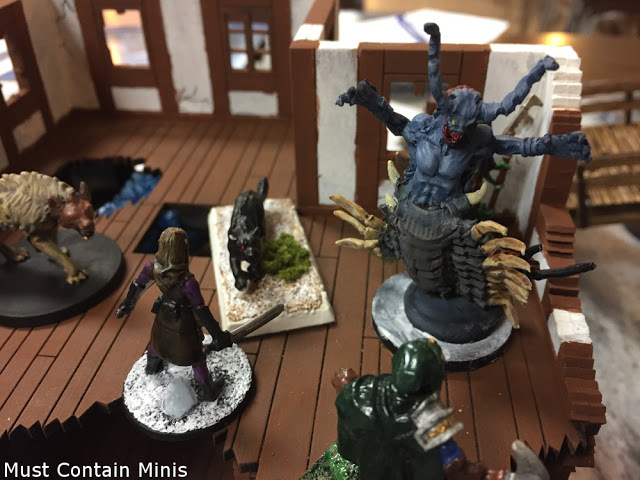 In the picture above, Tiszirain (the Centipede Demon) was painted by Jeremy Cada of Forbes Hobbies. Looks great to me!!! For the demo, I ran the “Rescue the Prince” scenario from Forgotten Pacts. Just like last time, I gave each player two secret objectives to complete for extra points (kind of like a homemade version of Ulterior Motives). One player (the Summoner) got extra points if he personally summoned Tiszirain and even more if he controlled Tiszirain and walked him off the board. Another player (the Necromancer) got points if Tiszirain was summoned by the Barbarian Wizard or Summoner. 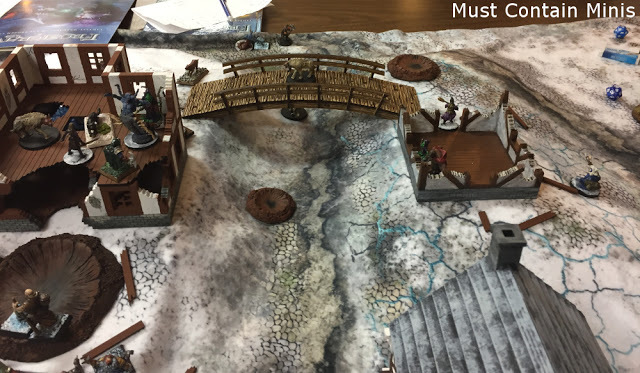 Two players got points if the prince was rescued and carried off the board (the Enchanter and Thaumaturge) with extra points if they were the ones that actually carried the prince off the board. The Beastcrafter was Neutral. He got extra points if anyone rescued the prince, or if he gained temporary control over Tiszarain. 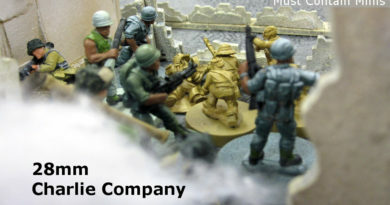 I set the table as in the picture below and predetermined the deployment areas of each warband. 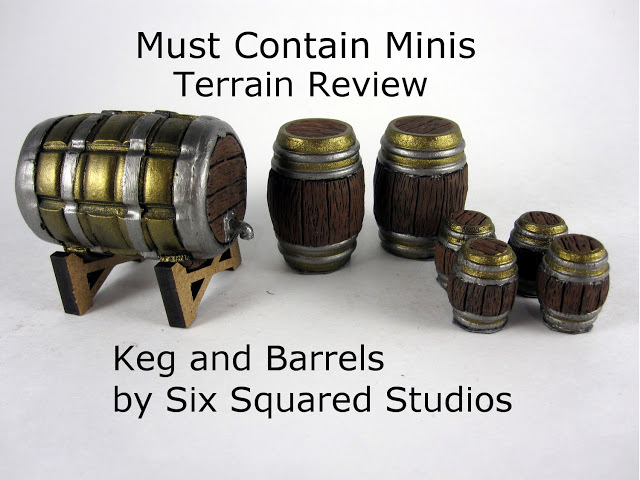 I kept the areas secret until the players selected their wizards and then allowed them to deploy simultaneously. All of the Wizards in this game are level 20. As far as all players are concerned, everyone wants to save the prince and prevent the Demon from being summoned. No one knew that the Summoner and Necromancer were working against the goal. The scene after deployment. In the middle left is the Summoner. Closest left is the Necromancer. To the right is the Thaumaturge. Next to him is the Enchanter and hidden in the top right corner is the Beastcrafter. 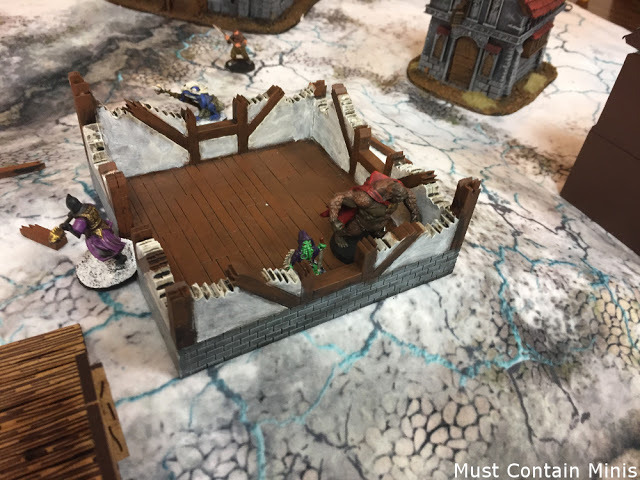 To save the prince, players had to kill the four Chilopendra Demons to take down a force shield and kill the Wizard hiding within the ruined house. If they do this by turn 8, the demon would not be summoned. All the players made a mad dash for the middle right off the top. 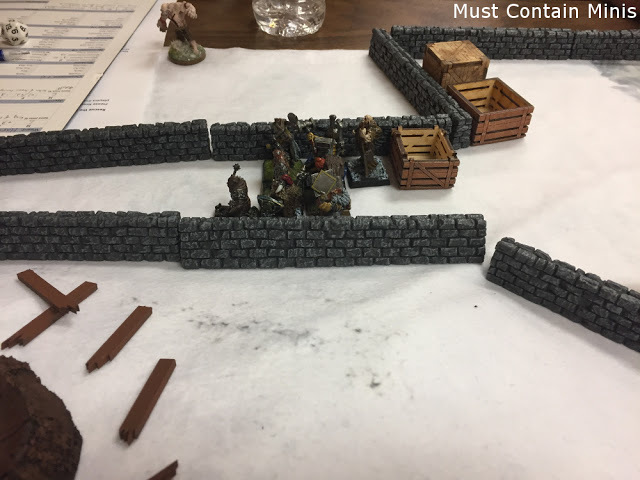 The Enchanter and Beastmaster chose to focus their attacks on the Thamaturge crew while the Summoner focuses on the Enchanter and Barbarian Wizard (the one sacrificing the prince). It is a bit of a free-for-all as all players want to save the prince (except the Necromancer). 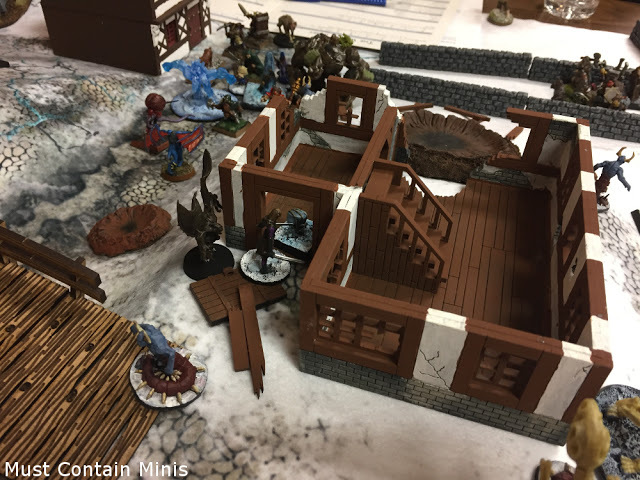 The Summoner passes through the forceshield and sends in his Captain and a Winged Demonic Servant towards the Barbarian Wizard. His other Demon is on a “suicide mission” to attack the Enchanter’s warband. He did this because he knew that once he controlled Tiszirain, he would lose control of the demon. You can only control one Demon at a time through a Bind Demon spell, so he figured that the other demon should be as far away as possible when Tiszirain appears. The winged red and blue demon there is actually an Imp summoned to give the other side of the table a more difficult time. It is basically a speed bump to help the Summoner reach the prince first. The Thaumaturge plays it cautious and moves his group as a large cluster. It is a good thing for him that no one on the board has an area of attack spell. His crew is made up entirely of melee hirelings. 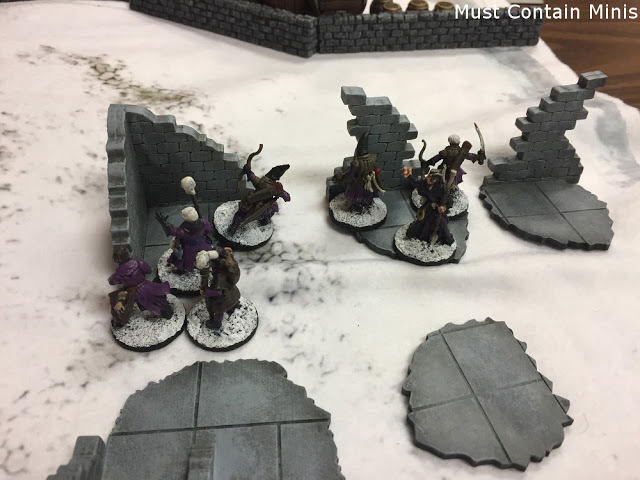 The Necromancer brings his bowmen and Wizard up to some cover. They choose to harass the Thaumaturge. 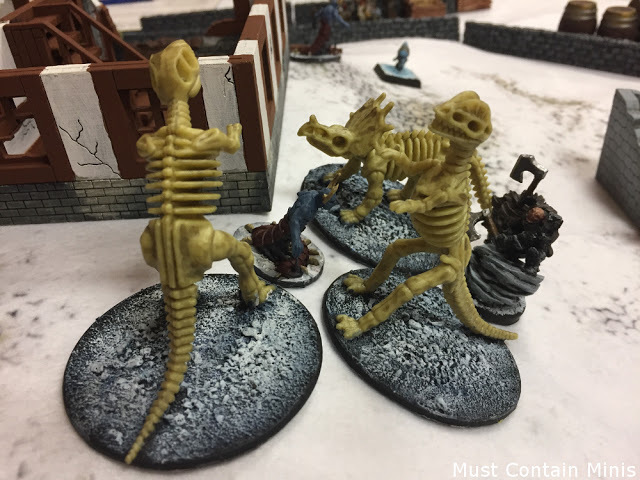 The Necromancer’s Giant Golems and Captain go after and kill one of the Chilopendra Demons. This disables the forcefield affecting magic and shooting attacks into the house. The rush to the middle is frantic and the Summoner gets up there first. 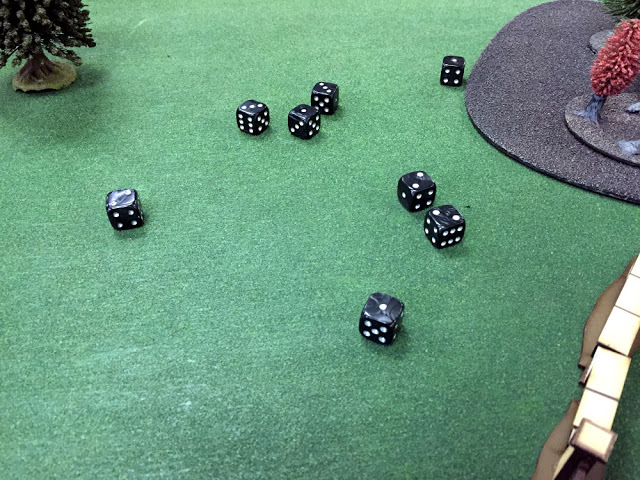 His speedy captain one-hit kills the Barbarian Wizard and his Wizard teleports to beside the prince. 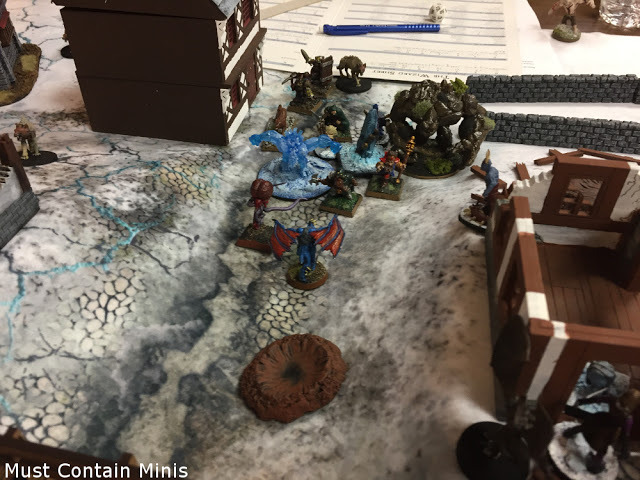 Everyone breaths a sigh of relief that the Barbarian Wizard is dead, and none of them realized that the Summoner was planning to Summon Tiszirain himself the next turn. Regardless, all of the players turned against the Summoner because they wanted to be the ones to carry the prince off the map. At this point, the forcefield is down and the Necromancer is in a position to pick up the prince (the angel carrying a child) next turn. The woman with two swords is his captain. The others don’t want to let the Summoner to be the one to carry the prince off the board. The Beastcrafter sends three of his animal companions to take on the Captain and the Enchanter leaps up a Knight. The next round the Summoner shocks everyone at the table by killing the Prince and summoning Tiszirain himself. For summoning Tiszirain, I gave the Wizard a free attempt at the Bind Demon spell. The Demon gets heavy bonuses, but the Summoner was lucky and gains control. Tiszirain arrives under control of the Summoner at the table!!! The other players are horrified! At this time, we are getting pretty close to the time limit of the game. We allow one more round before calling it a night. 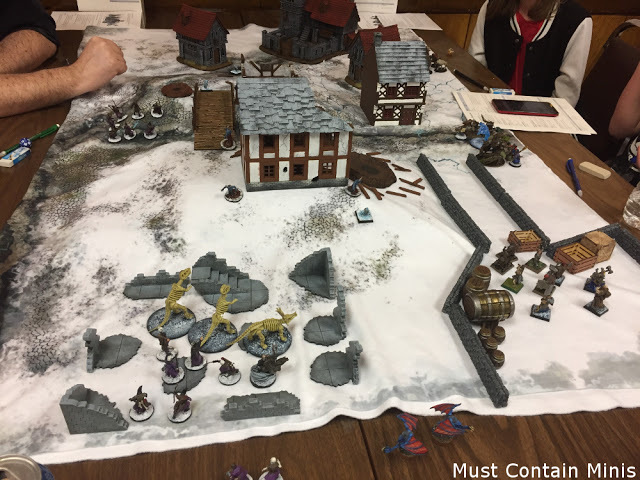 All of the players went for their secret objectives and kill points instead of the treasures so the Necromancer, Summoner and Enchanter were in the lead at this time. Seeing an opportunity, the Beastcrafter runs up and attempts to control the Demon as well. He is successful! The Beastcrafter Wizard (the Ape in Cape) gains control of Tiszirain. The Summoner’s apprentice (the small green guy) tries to take back control of the monstrous Demon and fails. At this time, we reached our time limit. We didn’t tally up the points because there were no prizes, but I believe the Summoner, Necromancer and Beastcrafter would have all been contenders for first place. Overall, it was a fairly successful demo. I had an enjoyable time and so did the players at my table.